The senior congressional official also said that Flynn's lawyer had conveyed the offer of testimony in exchange for immunity from prosecution to the Justice Department. Rep. Adam Schiff, D.-Calif., the ranking member of the House Intelligence Committee, acknowledged in a statement that the Justice Department's interest in Flynn's testimony could take precedence over Congress' wish to hear from him. He also said there are "many more witnesses and documents to obtain" before the House Intelligence Committee can consider any immunity request — specifically citing a background check document that would show whether Flynn reported work he did for any foreign entities. And, Schiff noted, "we should first acknowledge what a grave and momentous step it is for a former National Security Adviser to the President of the United States to ask for immunity from prosecution." President Donald Trump tweeted early Friday that Flynn was right to ask for immunity. In September, while discussing aides to Trump's opponent, Hillary Clinton, Flynn told Chuck Todd on Meet the Press that "when you are given immunity that means you've probably committed a crime." As NBC News reported Thursday, Flynn told the Intelligence Committee he was willing to be interviewed about the Trump campaign's possible ties to Russia in return for a no-prosecution guarantee. 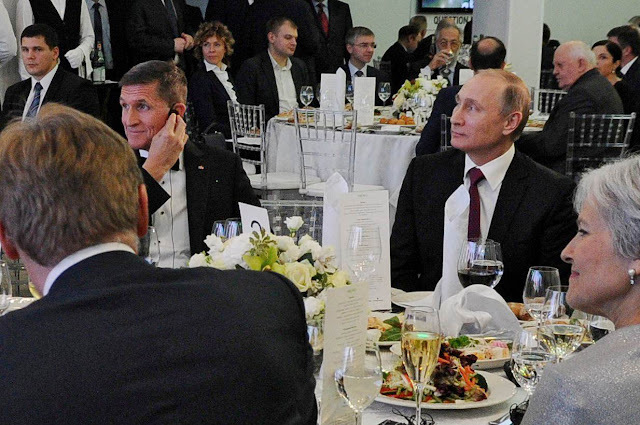 However, Kelner said, "out of respect" for the committees, he and Flynn would not comment on the details of the discussions — and he accused the media of being "awash with unfounded allegations, outrageous claims of treason, and vicious innuendo." "No reasonable person, who has the benefit of advice from counsel, would submit to questioning in such a highly politicized, witch hunt environment without assurance against unfair prosecution," Kelner said in his Thursday statement. He served as President Trump's national security adviser for three weeks before resigning for what the Trump administration said was misleading Vice President Mike Pence about his contacts with Russian Ambassador to the U.S. Sergey Kislyak. ARE REPUBLICANS PREPARED TO BURN DOWN THE SENATE? Even in a world where Republicans have shamelessly abandoned their supposed principles in order to embrace Donald Trump, the one thing about which they all still agree is that they must cut taxes on the rich. On this point, Trump happily concurs. Indeed, Trump's regressive economic views easily put him into what now counts as the Republican mainstream. Now that they are looking for a place to start all the winning that Trump promised his nonmajority of voters, the latest rumors are that congressional Republicans will take a run at the tax code. Other commentators have noted that this is hardly an easy lift, especially because the details of a tax overhaul will quickly destroy whatever unity remains on the right. That is surely correct, but my question here is a different one. Suppose that the Republicans in Congress, both their leaders and their most extreme members, actually manage to get their collective act together and agree on the details of a huge gift to their wealthy patrons in the form of a tax "reform" bill. Suppose also that Democrats in the Senate refuse to go along. Are Republicans so committed to reverse Robin Hood policies that they will finally abandon all pretense of preserving Senate rules? Now, the crazy thing is that this first tax cut for the rich (in the form of Obamacare 'repeal and replace') would have made a second one (this one coming in the form of 'tax reform') look more affordable. O'Brien is referring to the fact that the regressive spending cuts in TrumpRyancare were so harsh on poorer and older Americans that the bill overall saved money, even though there were huge tax cuts for the rich in that bill too. This matters because of a possible implication of the so-called Byrd Rule, which requires 60 votes in the Senate to pass a bill that will increase the deficit beyond the 10-year budget forecasting time frame. Yes, my eyes are glazing over too, but this actually becomes interesting rather quickly. Eliminating the $1 trillion of Affordable Care Act taxes and the federal spending associated with that law would have made this easier. Because they failed, Republicans will struggle to reach their goal of cutting corporate tax rates without piling on debt. In short, the idea is that TrumpRyancare could have paid for at least some of the net increases in debt that the coming regressive tax cuts will create. Readers might also remember the "fiscal cliff," which actually played out in two steps. In late 2010, when the Bush tax cuts were about to expire (all of them, not just the estate tax repeal), President Barack Obama and the Democrats agreed at the eleventh hour to extend the full package for two more years. Then, when those two years were ending in late 2012, we ended up with Vice President Joe Biden and Mitch McConnell meeting on New Year's Eve to hammer out a compromise. This was truly a case of waiting until the last minute. My skepticism, or perhaps it is more accurate to call it uneasy doubt, is that the Republicans could have used a successful vote on TrumpRyancare to reduce the need for offsets in their upcoming tax cut bills. This would require the ability to use net deficit reduction beyond 2026 in the health bill to be "bankable" as a credit that could be used against the out-year losses caused by the regressive cuts. But even if that is true, it is not obvious what the limits are on using one bill to offset another. I am, however, perfectly willing to admit that I am not a parliamentarian, and I simply do not know the answer to this question. I would not be surprised if my doubts turn out to be unfounded, but at the very least this argument is under-explained. It is true that there is at least one good administrative reason to allow cross-bill credits, which is that it would otherwise require all relevant bills to be stapled together in one bill. On the other hand, we would need to know how far back a Congress can reach to say that a bill has been "paid for." Because the Republicans shot themselves in the face on the health care bill, however, we actually do not need to know the answer to that question. Instead, we will at best be back in the position in which Bush and the Republicans found themselves in 2001. Again, however, we might not even get that far, because the better bet is that the Republicans will not be able to get their act together even on something as fundamental to them as tax giveaways to the rich. If they do decide to go nuclear, McConnell and the Republicans will surely blame Democrats for removing the filibuster rule for other presidential appointments when Obama was president. "They did it first!" Democrats will then say that Republicans were abusing the filibuster, and the whole argument will go nowhere, as usual. As I noted above, the Byrd Rule is more than a mere internal rule of the Senate, but the story is still the same. If Republicans want to deliver their regressive tax cuts on a permanent basis, they (with simple majorities in the House and Senate, along with Trump's signature) can pass a new statute amending or repealing the existing statute that embodies the Byrd Rule, to make it possible to pass their tax cut with only 51 Senate votes (possibly including Vice President Mike Pence). Will they do it? The bottom line is that McConnell and his right-wing colleagues (including those who masquerade as moderates ) will soon have to decide how much of the Senate they are willing to burn down. The two pending test cases, moreover, could not be more fundamental to the Republican base. Russian interference with American politics did not stop after the election, and prominent Republicans -- including House Speaker Paul Ryan and Sen. Marco Rubio -- have been targeted by coordinated social media attacks, cybersecurity experts told a Senate panel Thursday. Rubio -- a former primary opponent of President Donald Trump -- announced at a Senate intelligence committee hearing on Russian meddling that during last year's election his former campaign staff was targeted by hackers twice. Rubio said the attacks came from computers using IP addresses located in Russia -- once in July of last year, after he announced he would run again for the Senate and again, Wednesday morning. IP addresses do not necessarily confirm who conducted hacking, as it is relatively easy for hackers to mask their location. "Former members of my presidential campaign team who had access to the internal information of my presidential campaign were targeted by IP addresses with an unknown location within Russia," Rubio said Thursday. "That effort was unsuccessful. I would also inform the committee within the last 24 hours, at 10:45 a.m. yesterday, a second attempt was made, again, against former members of my presidential campaign team who had access to our internal information -- again targeted from an IP address from an unknown location in Russia. And that effort was also unsuccessful." Rubio's comment followed after one cybersecurity expert said Rubio himself had been the target of a Russian propaganda campaign designed to help Trump -- although the witness, former FBI agent and cybersecurity expert Clinton Watts, later said that all Republican opponents of Trump were targeted by Russians, not just Rubio. "This past week we observed social media campaigns targeting speaker of the House Paul Ryan hoping to foment further unrest amongst US democratic institutions," Watts told senators. The committee held its first public hearing on Russian meddling in the US election Thursday with calls for nonpartisanship, citing ongoing foreign interference that threatens "the heart of our democracy." "The vice chairman and I realize that if we politicize this process, our efforts will likely fail," Committee Chairman Richard Burr, a North Carolina Republican, said in his opening remarks. "The public deserves to hear the truth about possible Russian involvement in our elections, how they came to be involved, how we may have failed to prevent that involvement, what actions were taken in response, if any, and what we plan to do to ensure the integrity of future free elections at the heart of our democracy." There was little chance that Thursday's hearing would be as explosive as the House intelligence committee's first public hearing last week, which started off with FBI Director James Comey confirming the FBI is investigating possible coordination between Trump campaign aides and Russian officials and included Trump himself fighting back during the hearing on Twitter. Sen. Angus King, an independent from Maine who caucuses with Democrats, said on CNN's Erin Burnett "OutFront" Thursday evening that the work of the panel was multifaceted and could take awhile to find answers to all of the questions before it. "I want to slow down a little bit," King said. "There's plenty of investigation yet to be done." The differences between chambers was on full display as the Senate -- which gives the top Democrat on committees the title of vice chairman, unlike House's "ranking member" equivalent -- stressed bipartisan cooperation, the same day the leaders of the House committee were planning to meet and discuss the state of their troubled investigation. Thursday's hearing was not entirely without reference to political issues. Sen. Ron Wyden, an Oregon Democrat, made the case that the committee needed access to President Donald Trump's tax returns in order to investigate whether he'd been influenced by Russians. "We need to follow the money," Wyden said. He also sought to understand the ties between Putin's administration, Russian oligarchs and Russian crime organizations, saying: "Russia's corruption problem, may be our corruption problem." Watts responded that Wyden should "follow the trail of dead Russians," a clear reference to Putin critics who have turned up dead. Senate investigators are hearing from experts on disinformation tactics -- tools used by Russian operatives in the US elections and elsewhere to disrupt elections. "We are seeking to determine if there is an actual fire, but so far, there is a great, great deal of smoke," Sen. Mark Warner, the top Democrat and vice chairman of the committee, said in his opening remarks. There is a brighter spotlight on the Senate committee to investigate Russian meddling in the election as its House counterpart has shattered along partisan lines, and even some Republicans calling on the Senate panel to lead Congress' probe. Senate lawmakers also plan to interview former National Security Agency Director Keith Alexander and FireEye chief executive Kevin Mandia, a pair of cybersecurity experts, who are expected to answer questions about how Russian agents and an army of trolls utilized "fake news" throughout the 2016 election. "There were upwards of 1,000 paid Internet trolls working out of a facility in Russia, in effect, taking over series of computers, which is then called a 'botnet,'" Warner, a Virginia Democrat, said Wednesday. "If you Googled 'election hacking' leading up to the election and immediately afterwards, you wouldn't get Fox or ABC, The New York Times, what you got is four out of the first five news stories that popped up were Russian propaganda." Burr, meanwhile, said that he is keenly interested in Russia's attempts to influence European elections and whether Russian efforts in the US offer insights into their efforts to disrupt elections in Western democracies like France and Germany. "We feel part of our responsibility is to educate the rest of the world about what's going on because it's now into character assassination of candidates," Burr said Wednesday. Since that hearing, the House investigation has descended into chaos, but Senate investigators have stuck to a steady pace, largely ignoring their House colleagues. Warner and Burr both said Wednesday they are taking a deliberative approach -- trying to learn as much as possible before calling in high-profile witnesses like former National Security Adviser Michael Flynn, former Trump campaign chairman Paul Manafort, former Trump foreign policy adviser Carter Page and former Trump adviser Roger Stone. Seven professional staff from their committee have been given special security clearances to review the documents and now have access to the same materials usually limited to Congress' "Gang of Eight" -- the Republican and Democratic leaders of the House and Senate and their respective intelligence committees. And even though Manafort and Jared Kushner -- one of Trump's closest advisers who served as an intermediary for foreign policy and met with top Russian officials during the transition -- have offered to testify before Senate investigators, no date has been scheduled yet for them to come in. Instead, Warner and Burr said that they have a list of 20 witnesses they plan to call in and have scheduled meetings with five of those witnesses so far. Both men declined to name those witnesses, but Burr implied it would be smart to expect Flynn to be on that list. 0 Response to "Michael Flynn’s Immunity Request Rejected By Senate Intelligence Committee"